VOCAL’s acoustic beamforming algorithms are applicable to a wide range of the microphone arrays that exist in reverberation environments and can compensate for errors in the DoA estimation of the desired signal. The selection of the algorithm is based on the requirements of the application and the available hardware configuration (e.g. the number of microphones, the capabilities of the desired processor). Acoustic beamforming algorithms support uniform linear, circular, and square microphone array configurations. The number of microphones for real-time applications is limited only by the capabilities of the processor. Contact us to discuss your acoustic beamforming application requirements. Acoustic Beamforming algorithms include, but are not limited to, the following. 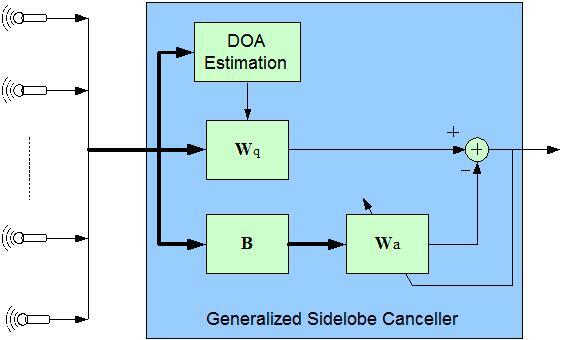 Time-Domain Generalized Sidelobe Canceller (TD-GSC) is the most commonly implemented acoustic beamforming algorithm. The desired quality of speech enhancement can be achieved by integrating any number of optional features with the beamforming scheme, based on the requirements of the application and the acoustic environments.